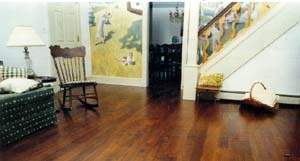 Often we must work with the existing woodwork of an older house. This stair area had to flow with the downstairs and the second story. The living and dining area floors were going to be Black Walnut. An existing Black Walnut handrail was to be reused, this tied in with the living and dining areas. 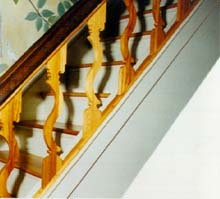 Since the handrail was a narrow one the balusters could not be thick or over power the handrail. The client wanted something created for the room and handrail. We had to remember that the house being remodeled was an old farm house, there was going to be a painted mural of the woman's memories as a child growing up in the house, and a light feeling was desired. After talking with the client we sat down with pen and pad. We came up with this design, made a pattern in Long Leaf Heart Pine, and took it to the client for approval. There was no question the design was perfect, once she saw it. Because the client wanted a light feeling to the stairs, painted risers were suggested, along with the skirting for the boxed in stairs. Now for the stair treads, landing tread and upstairs floor. Once again personality of the farm house came into play. The country wood used in the balusters would tie the entire house together. Long Leaf Heart Pine for the stair treads, landing tread, and all upstairs flooring. The client requested pictures of her remodeled house to be in our brochure so others can see what she cherishes everyday.